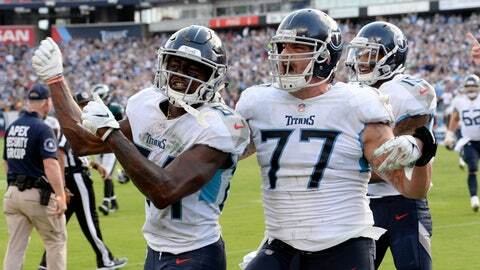 NASHVILLE, Tenn. (AP) — Mike Vrabel has been preaching about playing aggressive from the moment he arrived in Tennessee. “We’re trying to build our reputation as a team and a player on what we’re doing and what we will do as opposed to what we’ve done,” Vrabel said. Vrabel already has made it clear he’ll gamble on his Titans, going for it on fourth down more than anyone in the NFL. The Titans have executed, converting five of seven attempts. Three of those came on their game-winning drive in overtime . Vrabel is the Titans’ third different coach since that season, and they visit Buffalo (1-3) on Sunday sitting atop the AFC South with a tiebreaker in hand over Jacksonville. This starts a challenging stretch with five of the next seven games on the road, not that rookie coach is too worried about keeping the Titans focused. The Titans have areas to improve. The run game has been nonexistent except for Mariota facing the likes of Houston, Jacksonville and now Philadelphia. The defense can harass and sack quarterbacks, but they rank 25th against the run giving up 118 yards a game. Safety Kenny Vaccaro will miss “a few weeks” with an injured right elbow, a position where Tennessee already lost starter Johnathan Cyprien to a torn left ACL in August.